Praxis Theatre is thrilled to present the second in a series of theatre podcasts Toronto-based arts writer Alison Broverman is putting together exclusively for this blog. 1) Rob Salerno talks about the Fringe festival tour and his show Balls. 2) Darren O'Donnell talks about the Department of Culture. This podcast is about 13 minutes long. Here’s a link to the English translation of Wajdi Mouawad’s much discussed Open Letter to Prime Minister Harper. For more commentary on this, go here, and here. Praxis Theatre is thrilled to present the first in a series of theatre podcasts that Toronto-based arts writer Alison Broverman is putting together exclusively for this blog. 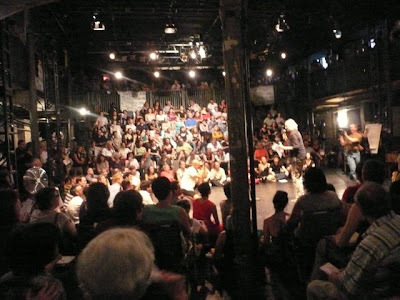 1) SummerWorks wrap-up interview with Michael Rubenfeld. 3) Broverman’s biggest regret of the summer. This podcast is about 17 minutes long. Please have a listen and pass along any comments, feedback, or suggestions for future podcasts. 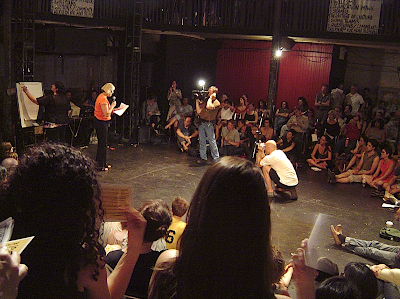 September 3, 2008 Town Hall meeting to mobilize in the face of sweeping arts funding cuts in Canada. Much thanks to Catherine Kustanczy for passing these along. Town Hall photos . 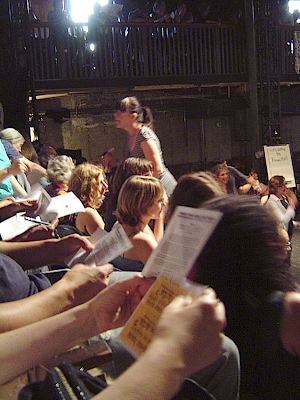 . .
September 3, 2008 Town Hall meeting to mobilize in the face of sweeping arts funding cuts in Canada. Above, Toronto Arts Council Executive Director Claire Hopkinson. 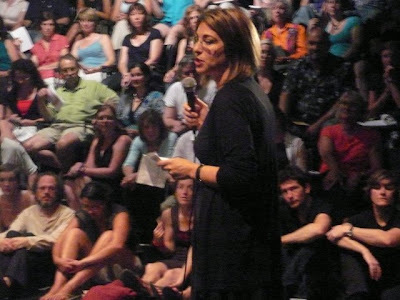 And here, author/activist Naomi Klein rallies the troops. Thanks to Naomi Campbell for passing these shots along. We'd love to post more. Send your Town Hall photos here. Thank you. Anyone got any good photos from last night’s Town Hall meeting at the Theatre Centre in Toronto? If you do and are are wondering what to do with them, please pass them along so we can post them here, with full credit, of course.